AFC Bournemouth's ex-Torquay midfielder Eunan O'Kane has backed Gulls boss Kevin Nicholson to lead the club away from National League relegation. 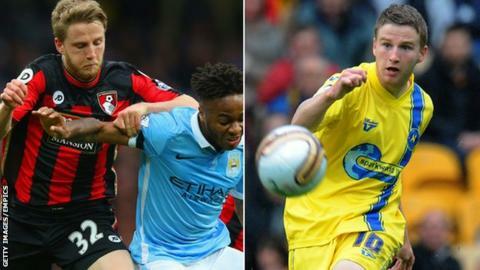 O'Kane was a key part of the Torquay side that made successive League Two play-offs in 2011 and 2012 before moving to the Cherries in 2012. "With Kev at the helm now I think he'll get them back on track," O'Kane said. "They look like a mid-table side at this point, if not a side that should be chasing the play-offs." He added to BBC Sport: "If they can get a few more wins under their belt and get safe, hopefully the season after this one will be a lot more encouraging than this one has been." Torquay are seven points adrift from safety, but moved off the bottom on Tuesday after a 2-0 win over relegation rivals Welling. The Gulls have two games in hand on all their rivals and play in the FA Trophy quarter-finals away at Bognor Regis Town on Saturday. O'Kane was one of four Torquay players, including Nicholson, to make the PFA's League Two Team of the Season in 2012, but the club finished bottom of the Football League two years later after manager Martin Ling was controversially sacked and budgets were cut. "It's not very nice," said O'Kane of Torquay's current predicament. "It's a club that gave me my chance on the football ladder here in England in the first team. "I look back here with very fond memories, we made two play-offs in my time at Torquay. To look now and see them being a league below and trying to fight off relegation is sad to see. "We had a very good team, but there's no reason why that can't be recreated again, there's nothing to stop this place if the fans can get behind them and come out and support them. "There's no reason why the club can't be back to where it was in those days or even go further."